Each major Android update brings changes to the notification shade and usually, they’re for the better. However, OEMs tend to add their own visual customizations which many users find annoying. Thanks to third-party apps we have plenty of methods to fix this. One of them allows you to get the Android Oreo notification shade on any Android. If you’d like your notification shade to look like the one on Android Oreo, but your smartphone is running an older Android version, keep reading to find out how to get it. 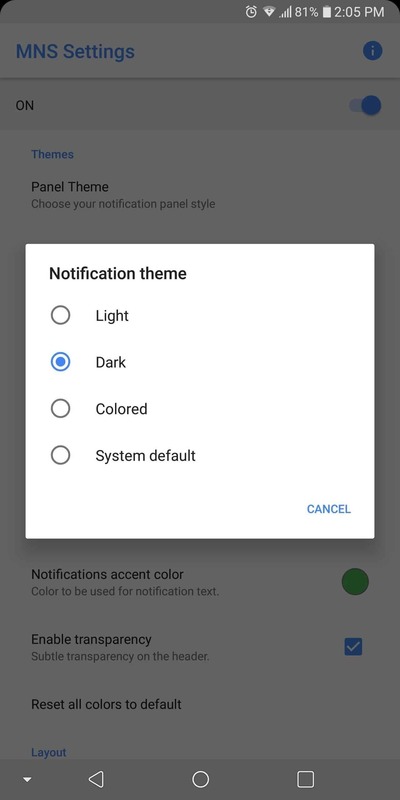 The app we’re talking about is called Material Notification Shade and besides bringing the stock Android Oreo notifications it can be used to adjust other settings. The best part is, the app has a free version and doesn’t require root. However, before downloading it from the link below make sure your phone isn’t running Android Oreo – it can run older Android versions starting with Lollipop. Launch the app after it finishes installing and enable the “ON” option. This will activate the Oreo style notification shade. To continue, enable all three requested permissions (Write, Drawing, and Notifications) and tap “Done” to save the changes and get back to the main menu. On the main screen, select “Panel Theme” under the Themes section. Select “Oreo” in the pop-up menu. This will make your notification shade to look like the stock Android Oreo. As you can see, you also have the Nougat option, so you can give that one a try if you want (assuming your phone isn’t already running Nougat). Now you can check your new notification shade and it should look similar to the images above. You can also enjoy Oreo’s themed media notifications. Simply open your music player app and play any song that has album artwork. 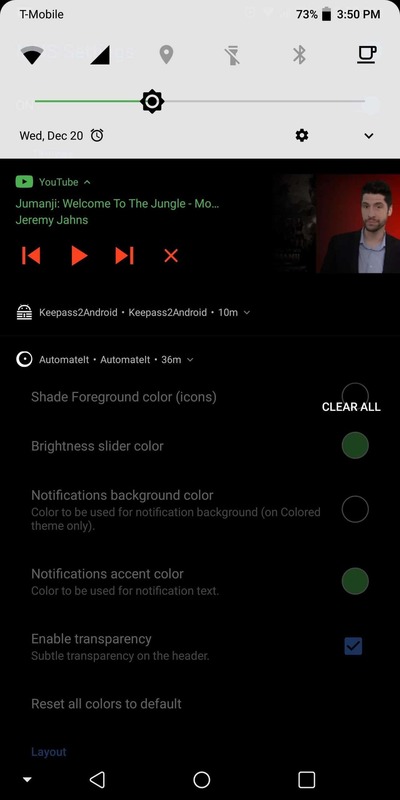 Then, open the notification shade and the media notification should have the background color matching the album artwork’s primary colors. The best part about using Material Notification Shade is that you don’t just get the stock Android Oreo look, you can also customize it. 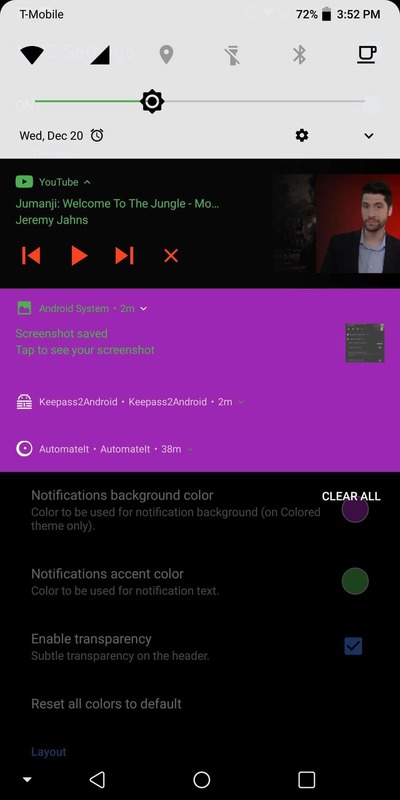 For example, you can use the “Notification Theme” option to change the background color of your notifications. If you want a color different than black white or the system default, select “Colored”. Then, you’ll be able to choose from an abundance of colors and even get more colors by using the “Custom” option from the bottom-left corner of the color menu. 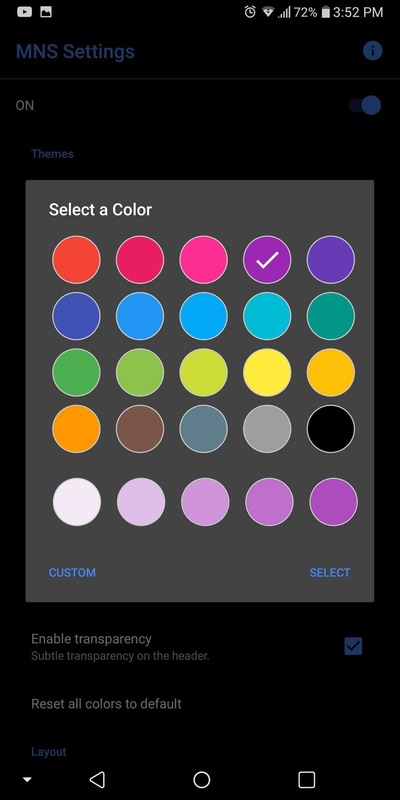 If you’d like to change the background color of the Quick Settings panel, return to the app’s main menu and from the Colors section select “Shade Background Color”. You can even use a custom image instead of a solid colored background. Moreover, use the “Shade Foreground Colors (Icons)” option if you want to change the color of the Quick Settings icons. As you can see, Material Notification Shade not only allows you to get the Android Oreo notification shade on any Android device, you can also personalize it further. Besides all of the options discussed above, it’s worth mentioning you can adjust the brightness slider in several ways. You can change its color and even its position in the expanded Quick Settings panel. While this app doesn’t require a rooted device the $1.99 premium version brings even more options and a bunch of extra features available for rooted phones.